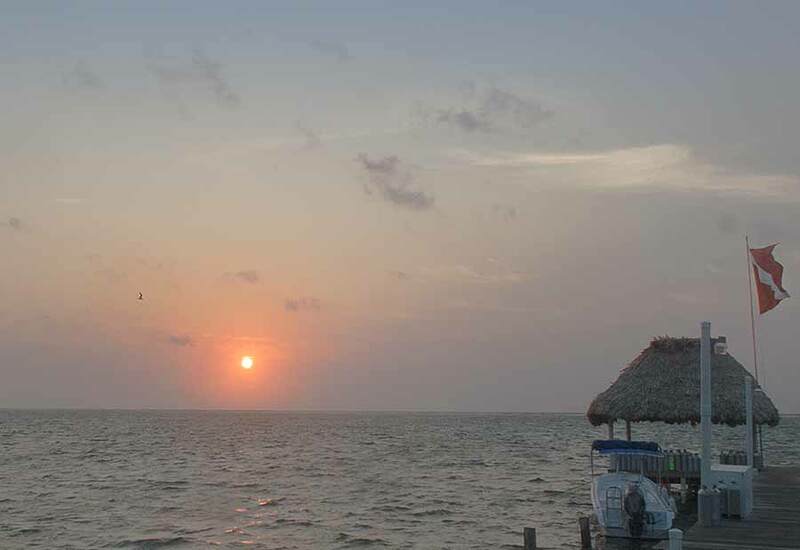 Belize NMS: Seasonably warm and dry conditions prevail. 24-hour forecast: Sunny with cloudy spells today and cloudy at times tonight. Little or no rainfall will develop, along with the chance of an isolated thunderstorm over inland areas this afternoon. General Outlook: For Tuesday and Tuesday night is for isolated showers or thunderstorms developing, especially over inland areas in the afternoon. Today E-SE 10-20 kts Choppy-Moderate 4-7 ft LITTLE OR NO RAINFALL. Tonight E 10-20 kts Choppy-Moderate 4-7 ft LITTLE OR NO RAINFALL. Tomorrow E 10-20 kts Choppy-Moderate 4-7 ft ISOLATED SHOWERS. Outlook E 10-20 kts Choppy-Moderate 3-6 ft A FEW SHOWERS, MAINLY SOUTH. Gentle to moderate tradewinds dominate the basin. Scattered showers are over Puerto Rico and the northern Leeward Islands. Isolated moderate convection is inland over Central America from Guatemala to Panama. Similar convection is over N Colombia. Upper- level ridging extends northward over the basin from South America with strong subsidence over the central and eastern Caribbean. Tradewind flow over the basin remains lighter than normal. As a result, seas are running fairly low across the area, with the highest seas of around 5-8 ft occurring near the coast of Colombia. Only slight change in the weather pattern is expected during the next couple of days as the surface ridge to the north remains relatively weak. Seas will build to 10 ft near the coast of Colombia, however, on Tue. On Ambergris Caye this morning the wind is from the East at 12 mph making the sea conditions around our barrier reef choppy. 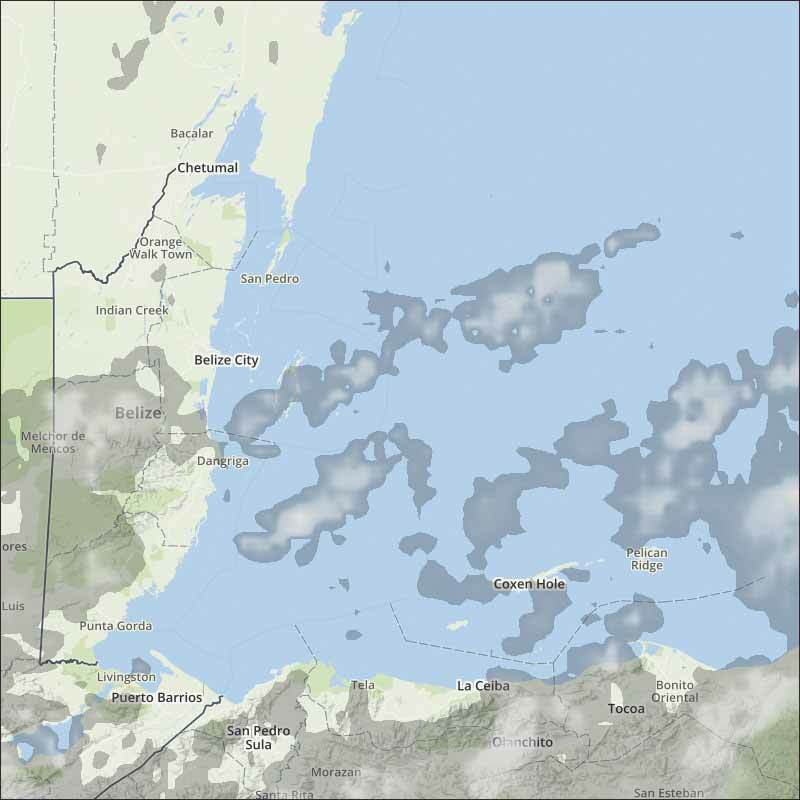 It's sunny and today's expected high is 88 f.
The heavier SW high-level clouds are further south of us now, only thin traces over Belize. 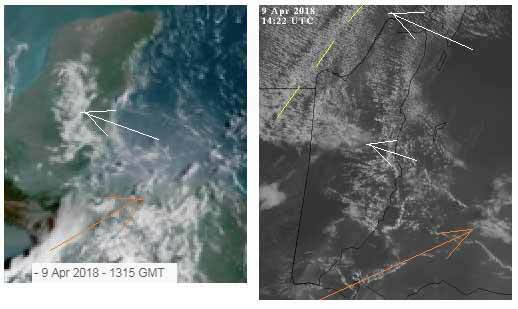 The easterly Caribbean has a fair amount of stringy cloud in it, now forming clouds along most of the Belize coastal reagions and significant amount over central Belize. There is a lot of haze in the Caribbean off Honduras, I suspect smoke haze. Looks like today will have more cloud than yesterday, but end up being fairly sunny, no rain expected.